Home » Trends » What Is The Importance Of Colors In Interior Designing & What Does A Color Signify? Color is considered as one of the most important factors of interior designing. Imagine that your mood is off, and suddenly your friend comes up with a bowl of your favorite ice-cream: Your mood is suddenly transformed and everything about your world changes. Colors have somewhat similar powers when it comes to Interior Designing. Using various combinations of colors in your home, you can introduce various shades of emotions: be it calming, pleasant, aggressive, comfortable, intimate, or sometimes even dramatic. Our reactions to various colors are actually inbuilt in our genes, and thousands of years of genetic programming aid us to respond and appreciate various colors within our environment. An expert Interior Designer will reveal that colors can completely alter your experience of the moment. In fact, before you select the most optimal color for the walls of your home, ask yourself: What you want to feel when you enter that room? There are mainly two types of colors, based on the tones: Warm and Cool. Warm colors like red can instantly energize a space, and give you an adrenaline rush; whereas cool colors like blue instill a calming, quiet, relaxing atmosphere within the space. Depending on the purpose the room serves, the homeowner and the Interior Designer should choose the best color. There are more than 10 million identifiable colors in this world; and a computer screen displays around 17 million colors to create a full-scale image. Here, we will focus on the most common colors; using which various other shades of colors are derived. Yellow: This color is a mixture of warm and cool tones, and it exhibits both knowledge and enthusiasm; calm and aggressiveness. It mainly evokes emotions of fun, happiness and hope. Red: Red is the color of blood, of aggression, of fierceness. It shows ambition, determination and leadership. Besides, it denotes physical desires, strong emotions and lots of sentiments. Use this color only where you want to exhibit your best side. Blue: Blue is the typical calming color. The color of water is blue; hence, it immediately introduces a deep sense of peace and satisfaction. On the other hand, blue also signifies vastness, limitless potential and abundant positive energy. By the way, blue is the most popular color in this world! Green: When it comes to green, then energy is the keyword. It represents relentless emotions, hard-work, enthusiasm and hope. Green is the color of money, hence, if you are an ambitious person, then green is the color which you should surround yourself with. On a different level, a mixture of blue and green signifies a balance in life. And to some extent: stability. Purple: Purple is the color of creation, of creativity and experiments. If you are an artist, then purple is the color which should surround your atmosphere and space. Purple signifies imagination, ideas besides showcasing the possibilities of life. Orange: If you know a person who is depressed, then orange should the color of his or her room. Orange denotes motivation, hope and lots of optimism. Using this color, home owners can induce positive energy all across the house. A combination of orange and purple is considered powerful for creative persons. Pink: Pink is the feminine color; it showcases unconditional love and affection; intimacy and compassion. Newly married couples can use pink color to induce energies of love all around, and older couples can use the same pink color to reignite their emotions and love. Pink means love, and love is actually life. Stay tuned with Kataak, as we demystify the usage of colors in interior designs, and help you understand the power of colors in bringing out the best. 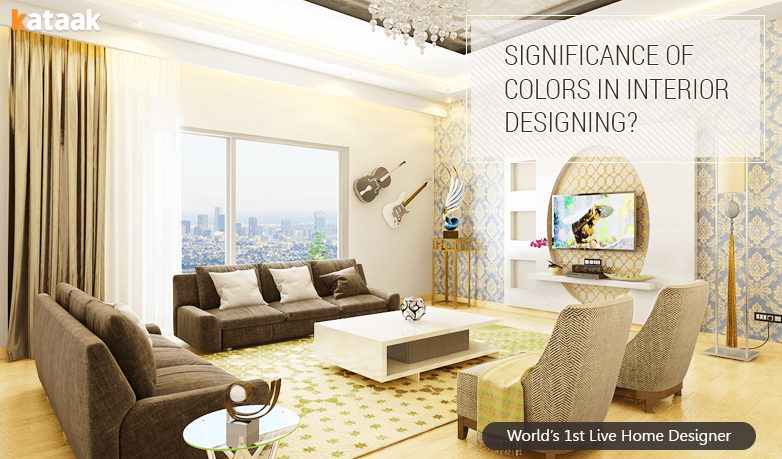 Kataak.com – World’s 1st Live Home Designer, which offers trillions of design combinations at Rs 0!